Fall in love with cake again! 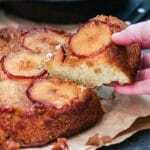 This Apple Upside Down cake is a less sugar dessert, but it tastes great. It’s a must try, especially if you’re looking for a healthier dessert recipe. I could try to tell you that I’m not obsessed with making less sugar dessert. When I decided to embrace my unmillennialness and start this podcast, I also decided it was time to get back to cooking and eating things that make ME happy. Not things that I see make other people happy on Instagram; and not things that make algorithms happy on Facebook. There’s a time and place for creating a low carb lasagna because you’re a recipe developer and you know your internet peeps need and want it. And then there’s the need to bake a cake. …the need to slice up apples. …the need to melt butter in a cast iron skillet. …the need to smell that sweet scent of brown sugar caramelizing. …and the need to pray to the cake gods that when you invert that unassuming, unadorned cake onto the platter to reveal the magic underneath, that not a morsel of it is gonna stick. There’s also a need — if you’re 40+ and fighting a slowing metabolism — to keep the sugar in check. Notice I didn’t say eliminate the sugar. Been there. Done that. It’s no fun. I could try to make “no sugar desserts” or even aim for “low sugar desserts”. But let’s be honest. 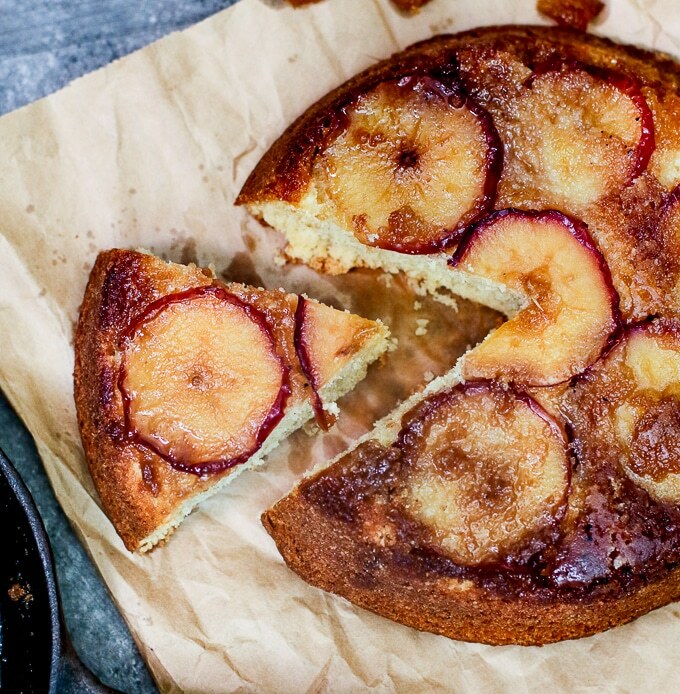 Life is too short to eat crummy cakes. I prefer simply a “less sugar dessert.” And as such, I’m doubling down on this new magical mix I’ve found of a 1:1 ratio of sugar: Swerve. I’ve yet to make a dessert that didn’t get a thumbs up from all 3 of my taste testers (read: hubs + 2 kids). And THAT is what really makes me happy. Fall in love with cake again! 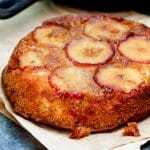 This Apple Upside Down cake is a less sugar dessert, but it tastes great. It’s a must try, especially if you’re looking for healthier dessert recipes. 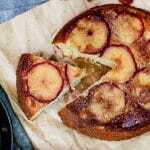 Melt butter in an 8-inch cast iron skillet or small round cake pan; sprinkle evenly with brown sugar. Arrange apple slices over brown sugar. Whisk together flour, sugar and Swerve in a large bowl. Add oil, egg, buttermilk and vanilla to dry ingredients; stir to combine. 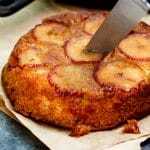 Spread batter into prepared pan; bake for 20 – 30 minutes or until wooden pick inserted into center comes out clean. Let cool 10 minutes in pan. Carefully invert onto serving plate. Serve warm. Recipe Note: I recommend storing any leftover “less sugar desserts” in the ‘fridge. Sugar acts as a preservative. By using less of it in a recipe, the shelf life of these recipes is reduced when left at room temp. 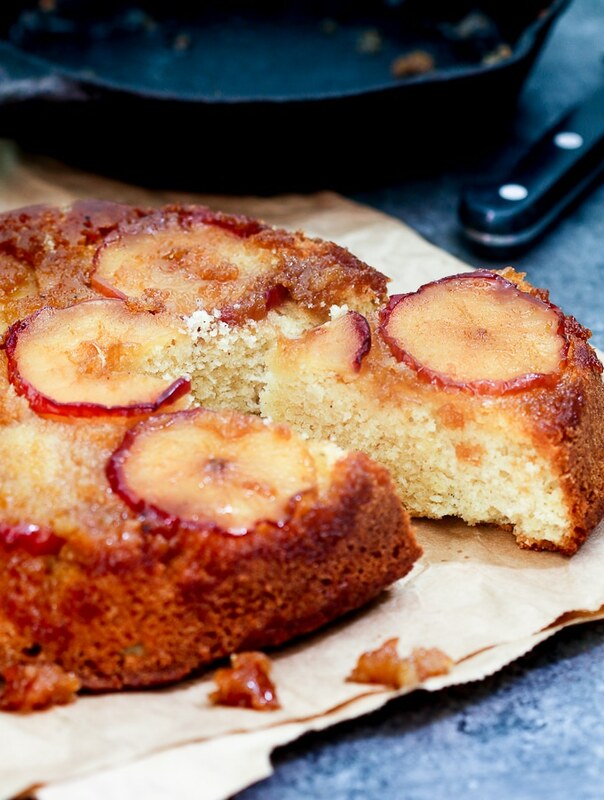 That cake looks so moist and less sugar makes it all the more perfect!